chic or something: Que veux-tu? It was all rainy and sad outside today, so I decided to post these pictures from last week when it was all nice and gorgeous out. I went into target with the intention of buying socks and came out with this top, which is so incredibly typical of me. In other news, I recently purchased a suit from Ann Taylor for job interviews and the fall career fair and such. For those of you who are small and have trouble finding business attire that fits you, Ann Taylor is your place. The suit fits great and they have an outstanding petite section. It was very difficult to not purchase one of everything... in every color. I will be featuring this suit very soon on here, so I am very excited about that. 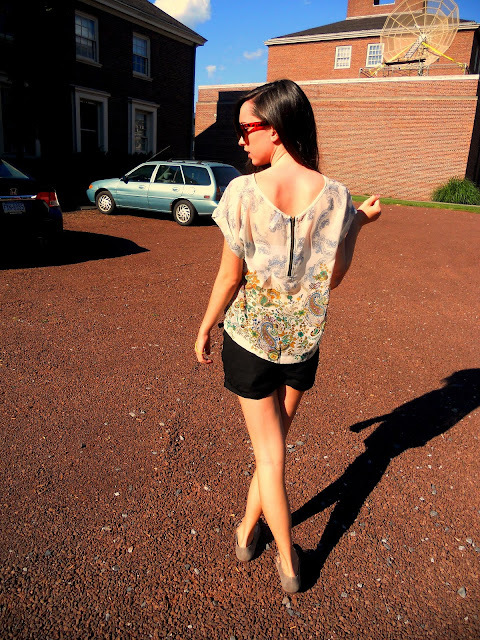 Lovely blog - I found you via IFB =) I LOVE your look - you pull it off so beautifully. The shoes are too cute and I've been looking for a belt like that but have yet to find one! I'll definitely have to hit up my local Forever 21 and scour the store for it =) I'm now following you via Google!